Does your Cougar, or any other car for that matter, have a vinyl top? It needs to be well protected from the elements, just like the rest of the car. Your local auto parts store has lots of items that will supposedly repair damaged vinyl, increase shine, deepen the color, etc. I've personally had bad luck with items like this, especially a product from Turtle Wax called "Extreme 2001 Professional Details Protectant". This stuff just rubbed itself into little crusty balls and make the vinyl look really bad. A product that I have found to be very useful, on the other hand, is found in the shoe section of your local department store. 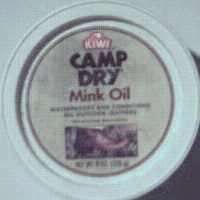 This product is called Mink Oil and is produced by a company called Kiwi. Just rub it into the vinyl, and it brings the color back like new. You should see the way two applications of it to the roof of my car makes the water bead up. I have also found that you can buy other Kiwi brand shoe products that work well on vinyl tops. One is their basic shoe polish. Many of their colors perfectly match the vinyl car tops. The navy blue kind restored the color to the top of mine instantly. This also contains mink oil, but I would recomend using a good coat of pure mink oil, just to be safe. Mink oil is the chemical that animals like otters secrete to make their fur waterproof, it isn't a petrolium product. NEVER apply a petrolium based chemical to the vinyl or other plastic parts of your car. It can damage them. The god among vinyl protectants. The scum of all vinyl cleaners. I'd really like to see your tips on this page. Just Email them to me, and I'll put them on the "Feedback" section. Each month one will be selected as the "Tip of the Month."